Ferrets are playful and they are very entertaining to watch. They are also smart and very curious and thus require training and lots of interaction with people to bond with them. Female ferrets are called jills, and males are hobs. Baby ferrets are called kits. In North America, spayed females are sometimes called sprites and neutered males called gibs. A group of ferrets is a "business of ferrets." Most ferrets obtained in North America are spayed or neutered and de-scented at a very young age before being sold. There are often misconceptions about whether ferrets are domesticated, and the short answer is they are. They have been domesticated for probably 2,000 years or more and were brought to America as pets as long as 300 years ago. Nevertheless, in many places, they are still not legally recognized as a domestic animal for the purposes of keeping one as a pet. The domestic ferret is sometimes also confused with its wild cousin, the black-footed ferret. The name ferret is derived from the latin furonem, which means "thief." Ferret owners can attest that this is a well-deserved name, as they will happily steal anything they can get their paws on and hide it in their house. Ferrets come from the same family ("Mustelidae") as badgers, wolverines, otters, mink, weasels, black-footed ferrets, and polecats. The distant ancestry of the domestic ferret is somewhat of a mystery, although they are very closely related to the European polecat. While most ferrets don't mind spending time in a cage since they sleep for long stretches during the day, it's recommended that they have at least four hours outside the cage every day. This means you'll need to ferret-proof your house, then go through and ferret-proof it again. These creatures are smart and curious, and can fit through small spaces you might not have imagined. Keep soft bedding on the floor of your ferret's enclosure, and make sure it has a good, sturdy latch on the door because the animal may be smart enough to figure out how to open it. Make sure there are toys for your ferret to play with and chew on. The temperature near its cage should be free of any drafts, but not in an area that gets too warm. The ideal temperature is between 50 and 75 degrees Fahrenheit. Ferrets are known as obligate carnivores and must eat nearly constantly. Since food passes through a ferret's digestive system relatively quickly, and they can't absorb nutrients from plants, these animals need a lot of animal protein and fat in their diets. Meat, eggs and cold water fish are excellent foods for ferrets; avoid foods that are high in sugar or fiber. Grains are not recommended for ferrets, since they're difficult for the animals to digest. A ferret's high metabolism means it needs to eat about every three to four hours. It's OK to make food readily available to ferrets all the time; unlike some animals, they rarely overeat. Make sure they always have access to fresh, clean water as well. Adrenal gland disease is perhaps the most common health concern in ferrets. Poor diet and a lack of UVB light are believed to be contributing factors, and some researchers believe the early spaying of ferrets (recommended to prevent aplastic anemia) may also play a role. Symptoms of adrenal gland disease include hair loss, genital inflammation, itchiness, and aggression or irritability. Other possible health problems with ferrets should be diagnosed by your veterinarian, so note any symptoms that seem abdnormnal for your ferret. Ferret lymphoma is a common cancer that affects the animal’s lymph nodes. Unfortunately, it’s almost always fatal and there are no preventative treatments. Ferret dilated cardiomyopathy is a heart condition that can lead to sudden death. A lack of taurine in a ferret’s diet is believed to be responsible. Simply put, this ailment is similar to heart failure; the animal may be weak, lethargic and wheezing. This is a condition that must be diagnosed by a veterinarian (if caught in time). Some medications are available but there is no cure for dilated cardiomyopathy in ferrets. Digestive disorders, including obstructions, are common since ferrets put many things in their mouths that don't belong there, including their own fur (which can result in hairballs). If your ferret loses weight, can’t keep food down or isn’t defecating normally, these may be signs of a potentially life-threatening gastrointestinal obstruction. Seek medical care as soon as possible. Aplastic anemia, which usually has symptoms including lethargy, weakness, and pale gums, is common in ferrets. 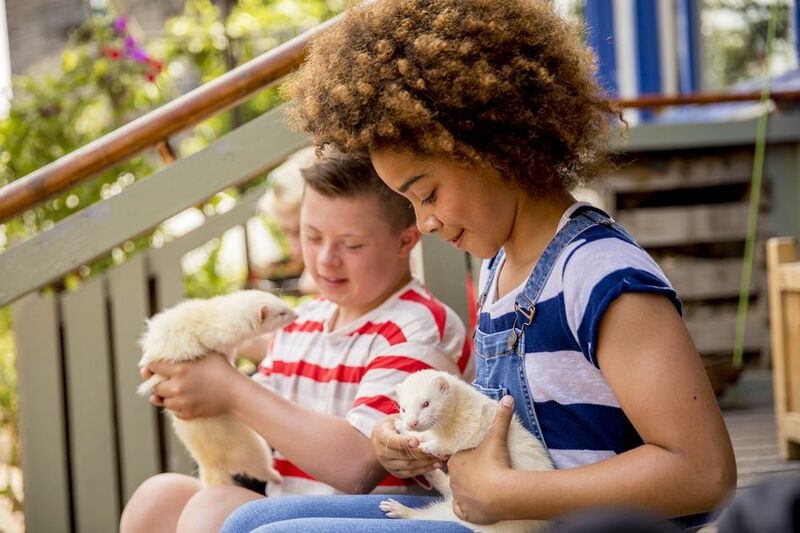 Female ferrets that have been in heat for more than a few weeks without mating are at risk for becoming anemic, which is why it’s recommended to pay your ferret at a young age. Dental problems can plague ferrets, so avoid offering kibble; its teeth are meant for crunching and tearing and kibble isn’t up to the task. Just like humans, ferrets can develop painful cavities and tooth decay. Brushing its teeth (if you’re brave enough) or providing suitable chew toys are ways to avoid a trip to the dentist. If a ferret gets a diseased tooth, the only remedy is to remove it. This should only be done by a qualified medical professional. Distemper was once a major threat to ferrets’ health, but has been mostly eradicated thanks to an effective vaccine. But this fatal, highly contagious condition still exists in some places. Symptoms include watery eyes and inflammation of the face. Is It Legal to Own a Pet Ferret? Before you purchase a ferret, make sure it's legal to own one where you live. Ferrets, like other exotic animals, have been banned as pets in some places. New York City, for instance, instituted an infamous ferret ban in 1999, and the animals are illegal as pets in most of California. If you do procure a ferret for a pet, be sure you're dealing with a reputable breeder who has records for the animal's vaccinations and any health issues. It may cost a bit more than going to a pet store, but you're more likely to get an animal that's healthy and well cared for. Ferrets have a reputation for being smelly. It is true that they have a distinctive musky odor, but it is neither offensive nor overpowering. This smell comes from their skin glands and is present whether the ferret is de-scented or not. While occasional baths are recommended, frequent bathing will not reduce the scent, and will likely make it worse as the skin will get too dry and the glands will produce more oils in an effort to combat the dryness. Ferrets are usually de-scented in North America, which involved removal of the scent glands. Their scent glands similar to that of a skunk, and they will release (not spray) the contents if threatened. However, ferret scent gland secretions are milder than those of skunks and the smell dissipates quickly and washes away easily. You also can check out our other profiles of small pets.